1. Which of the following statements are true and which are false? Give reasons for your answers. (i) false, infinite lines can pass through a point. (ii) false, only single line can pass through two distinct point. (iii) true, they can be produced both sides indefinitely. (iv) true, all the circles are drawn from radius. (v) true, all three lines are equal to each other. (i) the two lines never meet each other and distance between them are equal. (ii) the two lines stand on each other such that the angle between them is a right angle . (iii) the lines which has two point. 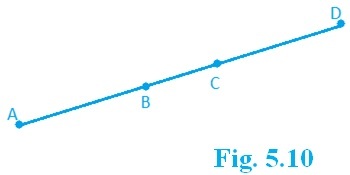 (iv) the distance between centre and circumference. (v) the closed figure which has all sides equal. Yes, this postulate contain two undefined terms that lines and point. Yes, this postulates are inconsistent because they deal with two different situation and none of them follow the euclid’s postulate because it is based on axiom . 4. If a point C lies between two points A and B such that AC = BC, then prove that AC = AB. Explain by drawing the figure. So, C and C` is same mid-point mean it is coincident. This is true in anything in any part of the world therefore, it is universal.